The words "tom yam" are derived from two Thai words. Tom refers to the boiling process, while yam refers to a Thai spicy and sour salad. 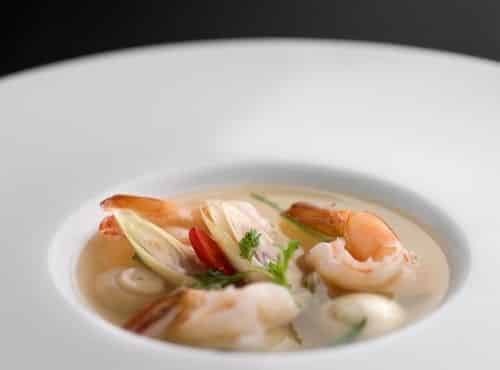 Indeed, tom yum is characterised by its distinct hot and sour flavour, with fragrant spices and herbs generously used in the broth. The basic broth is made of stock and fresh ingredients such as lemongrass, kaffir lime leaves, galangal, lime juice, fish sauce, and crushed chilli peppers. The tips are to boil the basic broth in a large saucepan and simmer 15 minutes, then stir with chilli until it well blended. Add imported fresh king prawn, mushrooms, onion and chilli, and continue to simmer until the meat is cooked. Following, add tomato to it soup; finally remove lemongrass, galangal and lime leaves before serving. None may be realised that the juice coming from fresh prawn once mixed with other ingredients presents a unique taste of Tom Yam Kung. During World War II, Thailand suffered a rice shortage. To reduce domestic rice consumption, Thai government at that time promoted rice noodles. Since then, Pad Thai has become one of the top Thailand's national dishes. Pad Thai at Eat-Thai is far distinct than any other places because the way we cook. 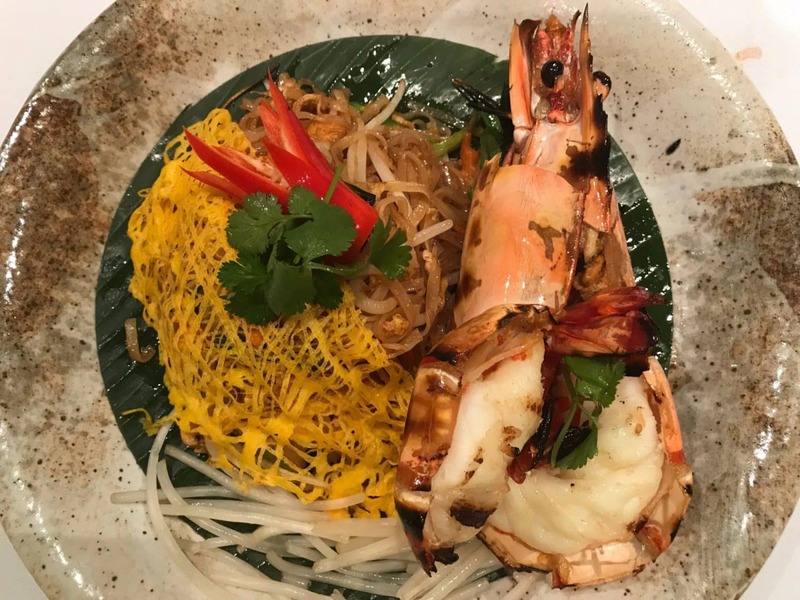 The prawn is imported from Madagascar and the noodles simmered with palm and white sugar mixing with tamarind, fish sauce and dark soya sauce, and add small pieces Chinese chives. Then heat them with vegetable oil and stir-fry chopped garlic together with the prawn. Drain away any excess liquid and wrap it with a netted omelette. Finally, top the plate with the bean sprouts and decor vegetable. 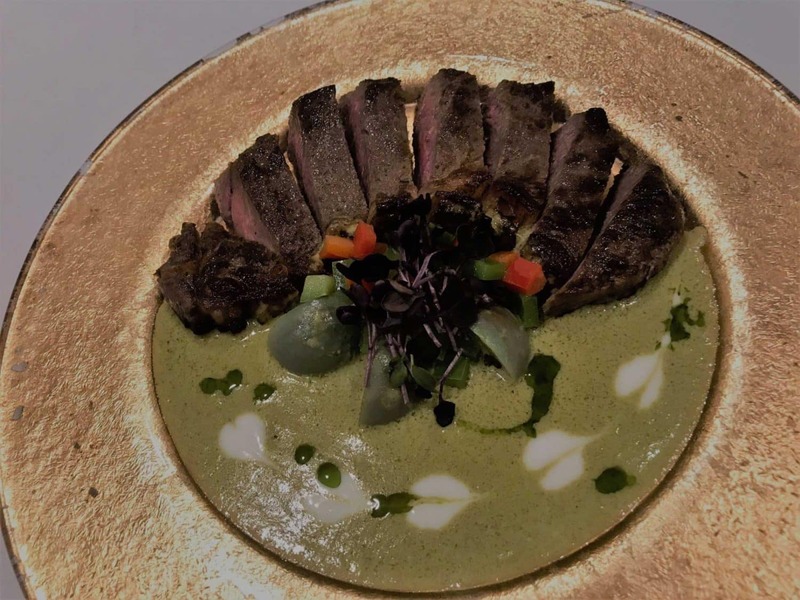 Thai Green Curry was invented during the reign of Thai King Rama VI who studied Law and History at Christ Church, Oxford in 1899. Eat-Thai imported fresh sirloin beef and grilled chicken breast from Oxfordshire and mixed them with herbs before cooking. The paste is traditionally made by pounding in a mortar, green chilli, shallots, garlic, galangal, lemongrass, kaffir lime peel, cilantro roots (coriander),ncumin seeds, white peppercorns, shrimp paste and salt. Firstly to cook, we fry coconut cream until the oil is expressed to release the aromas and add the ingredients including aubergine, pea and vegetables afterwards. For this signature, many customers order roti as an alternative to jasmine rice. Place the duck breasts skin side down into a large frying pan, and place on a medium heat (without oil) and cook for about ten minutes until the fat has rendered out, and the skin has gonegolden brown and crispy. The next step is to fry with the olive oil, garlic and ginger, then cook on medium heat stirring constantly. Make sure that the meat cooked in medium rare. Following, add the tamarind puree, oyster sauce, fish sauce, palm sugar, orange and sliced ginger, then cook until dissolved. 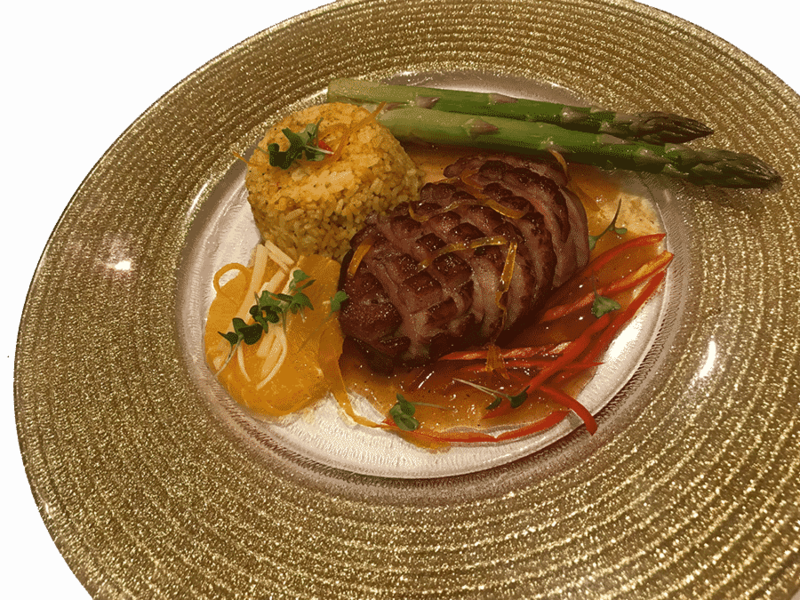 Carve the duck breast into 5 or 6 pieces and place on top with asparagus and other greens. This dish goes extremely well with yellow fried rice. Massaman originated in the Central Thailand at the cosmopolitan court of Ayutthaya in the seventeenth century, through the Persian merchant. 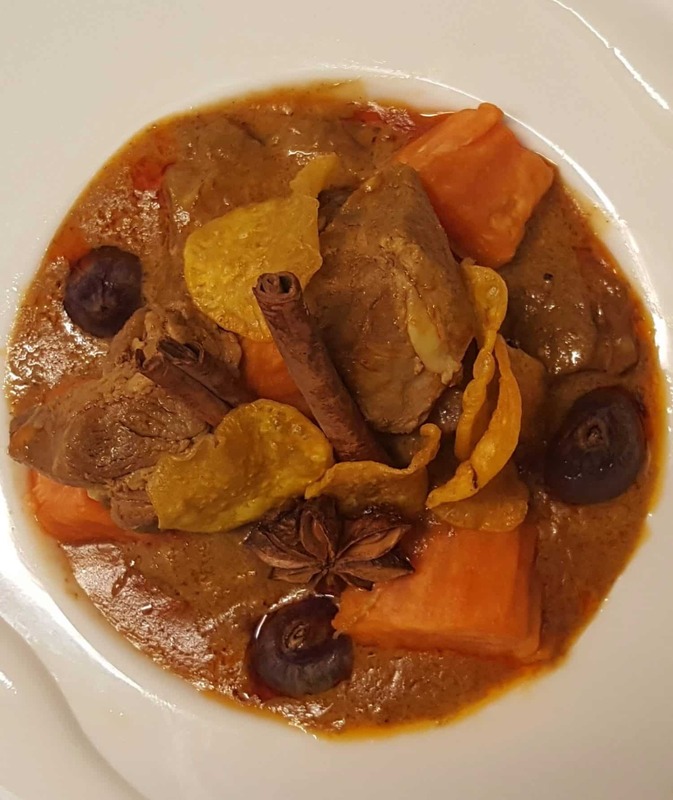 The flavours of the Massaman curry paste come from spices that are not in common with Thai curries, in which are cardamom, cinnamon, cloves, star anise, cumin, bay leaves, nutmeg and mace. These are combining with local produce such as dried chilli peppersseeds, lemongrass, galangal, white pepper, shrimp paste, shallots and garlic. The paste is first fried with coconut cream, and only then are meat, potatoes, onions, fish sauce or salt, tamarind paste, sugar, coconut milk and peanuts added. Massaman is usually eaten with rice and roti as an alternative.